Being a great guitar teacher is about a lot more than just teaching guitar. Training your students to practice correctly, so they see consistent progress and feel motivated to practice guitar on their own in between lessons. Most guitar students are not lazy. They simply never learned how to practice the right way... this is why most don't practice as much as they should. This means you have an opportunity to help your guitar students in ways most teachers cannot (more on this below). Becoming a coach to your guitar students and motivating them to believe in their musical potential, so they consistently do what you tell them to do. This is the most difficult part of teaching guitar well. Without this coaching, your studens lose their motivation, stop believing in their own potential and in your ability to help them improve... and when that happens - students quit. The better you are at training your students to practice and keep a positive mindset, the longer your students stay with you, the happier they feel, and the more successful you become. Teaching is the process of communicating knowledge and musical concepts to your students. Training and coaching are about helping your students understand, apply and integrate their knowledge. Great guitar teachers are masters of all 3 skills. This is a big reason why many of their students become great musicians very quickly. Excelling in all 3 areas also makes it easy to teach your students in innovative ways and earn more money teaching guitar. Show your students that they can master whatever skill they practice and struggle with. This raises their confidence, builds their trust in you and makes them more likely to persevere through the process of reaching their goals. You build your students’ confidence by simplifying problems they struggle with to make them easier to solve. Your student may play each measure of this lick cleanly and up to speed, but struggle to put them together. Your first goal is to prove to your student that he can play this passage. You can do this without slowing the lick down or making your students practice anything hard. Here is how: sustain the note at the end of the first measure to give your student more time to think and prepare his hands to switch to the 2nd measure. Sustaining the last note of the 1st measure creates a variation on the guitar lick that is much easier to play than the original. This allows your student to practice both measures at performance speed (without slowing down). After you build your student’s confidence, make the transition note shorter and shorter until he can play the original lick at the right speed. Answer: Most of your guitar students’ problems are caused by their ears and brain, NOT by their hands. Their ears are not able to keep up with their hands. Find a way to reduce the number of things your students’ brain has to focus on at once. This makes solving problems feel a lot easier. Watch the video at the top of the page to see another example of giving your guitar students frequent victories during your guitar lessons. Take this guitar teaching test to see how good you are at teaching guitar and learn simple things you can do to become a better teacher for your students. to practice in order to get results. that need the most improvement. You can challenge your students more after they feel confident in their ability to overcome their problems. Create variations on the exercises your students are practicing. Your variations must expose their problem and force them to focus on it more. Make the problem harder. Example: ask your students to play a guitar lick with difficult fretting hand stretches lower on the fretboard (where the frets are further apart). Make the problem come up more frequently. Example: ask your students to repeat a difficult picking hand motion more than once in a lick. This gives their hands more chances to practice it. Don’t feel confident (yet) about their ability to overcome challenges and reach their goals. Don’t fully trust you or feel confident in your ability to help them reach their goals. Most guitar students quit lessons because they don't like the process of facing their challenges and practicing to overcome them. This step of the coaching process determines how quickly your students improve their skills and reach their goals. Being an effective guitar teacher helps you keep your guitar students studying with you for years. Giving your students instant victories helps them believe in their potential to improve as musicians. 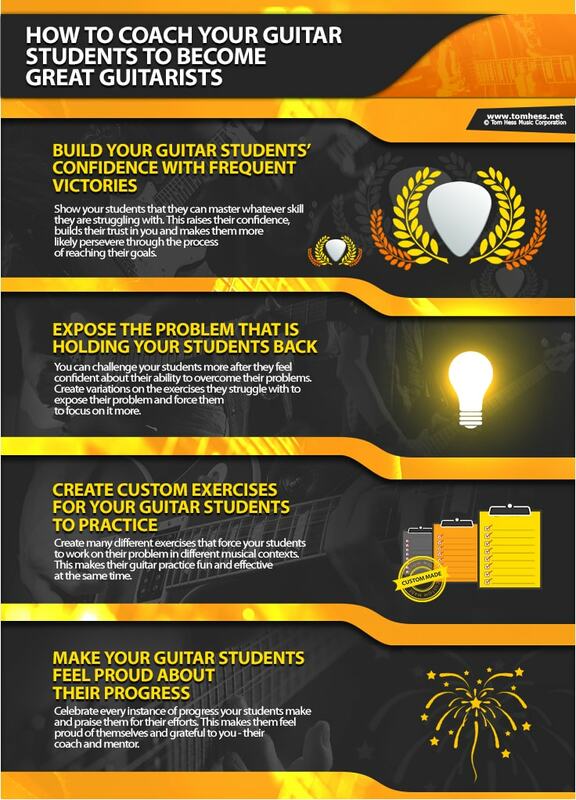 Exposing the true causes of their problems gives your students a path to follow to become great guitar players. It's important to make your students’ guitar practice effective and fun at the same time. This keeps them engaged all through the process of reaching their goals. Show you students how to transpose a lick into another scale or key. Create several (different) guitar licks for them that contain the same guitar technique challenge(s). Create a musical etude from the original guitar lick, to integrate it into real-life guitar playing. Celebrate every instance of progress your students make and praise them for their efforts. This makes them feel proud of themselves and grateful to you - their guitar teacher, trainer and coach. 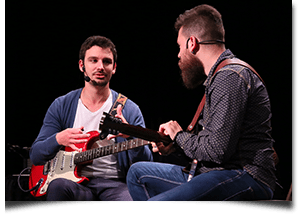 Now that you know the best way to teach guitar, the next step is to test your guitar teaching skills & learn how to become a better guitar teacher for your students. Take this guitar teaching test and learn how to become the guitar teacher your students will feel proud to study with. About Tom Hess: Tom Hess is a guitar teacher, music career mentor and guitar teacher trainer. He trains guitar teachers from all over the world how to earn 6-figures per year teaching guitar, while working less than 40 hours per week. Learn how to become a very successful guitar teacher.